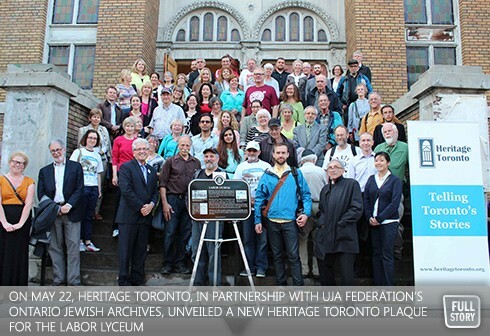 By Dara Solomon-On May 22nd, with a crowd of approximately 100 spectators looking on, Heritage Toronto in partnership with UJA Federation’s Ontario Jewish Archives unveiled a new Heritage Toronto plaque for the Labor Lyceum, the epicentre of political activism for Toronto’s textile workers from the 1920s through the 1960s. J.B. Salsberg, a lifelong labour activist, wrote that “no single institution and no single building on Spadina – the main street of Jewish Toronto – was more important in the refashioning of the Jewish immigrant into an actively involved Canadian Jew,” than was the Labor Lyceum. The plaque will be installed at the southwest corner of Spadina and St. Andrew. Due to the rain, the event was held inside the beautiful “Minsker” synagogue. Remarks were made by OJA chair Eric Slavens who previously served on the board of Heritage Toronto where he initiated the Jewish plaquing initiative and raised the funds to make it possible. Toronto city council member Adam Vaughan reminisced about his early days as a councilor when former city councilor Howard Moscoe drove him up Bathurst to see the current-day shuls and then took him down to the Market to show him where the community originated. MPP Mike Colle spoke about the significance of Jewish Heritage Month. Guest speaker Harry Arthurs, former dean of Osgoode Law School, labour historian, and grandson of Henry Dworkin, founder of the Labor Lyceum, spoke eloquently about the role his grandfather, an enterprising businessman, played in the community. The Dworkin Travel agency helped bring hundreds of Jewish immigrants to Toronto from the looming dangers of Europe. Additionally, Dworkin along with his partner Sam Easser, encouraged garment union workers to purchase shares for the construction of the Labor Lyceum Association at five dollars each. In 1924, the Association purchased two houses at 344 and 246 Spadina Avenue. Five years later, they added meeting rooms. In addition to the labour activity, the seasonal nature of the textile industry meant that workers could socialize and strategize at the Labor Lyceum during slow work periods. The plaque commemoration was followed by the Ontario Jewish Archives’ Sense of Spadina tour that focused on the role Jews played in the garment district and union movement. Participants enjoyed seeing the sites of the former Jewish neighbourhood and learning about Toronto Jewish life in the Kensington Market area.